We dug deeper and found an old UPN promo poster utilized during the launch campaign for the series which introduces the cast in a strong, heroic pose in their EVA suits as the pioneers of space exploration in the Star Trek universe. It harkens back to that sense of discovery, heroism and exploration that served as the basis for the Star Trek concept. The image conveys the same spirit of adventure as The Right Stuff and other iconic stories of pioneers exploring a new frontier. We felt there was no better way to show who those characters really were and their significant role in the Trek mythos. That art became the basis for the new Blu-ray cover design. And for those lovers of the ship, we’re going to feature it on the back cover. We also read that many fans thought images representative of key scenes/episodes from the respective seasons should be used, and we are going to include such images on the backs as well. Something in my gut told me that none of the proposed covers were right, and that was confirmed by everyone in the office picking a different one. Usually one stands out as the unanimous favorite. So I decided to go to the best source possible… the fans at Startrek.com. And I’m quite happy we did so. By going through this process, I think we came up with an even better cover than the three we had originally proposed and hope we are really capturing the essence of how fans regard the series with the new design. What’s great is that even though we didn’t go with any one of the three polled choices, the fans influenced the direction of the cover art for the Blu-ray release – personally, I think that’s a more interesting and cooperative outcome. Part One: Countdown - Chronicles the challenges faced by the producers and creative staff as they attempt to launch a new chapter in the Star Trek® saga by making the then-radical decision to create a prequel to the beloved original series. Features all new interviews with key personnel including creators Rick Berman and Brannon Braga, production designer Herman Zimmerman, technical consultants Michael and Denise Okuda, writers Andre Bormanis, Phyllis Strong and more. Part Two: Boarding the NX-01 - Follows the team as they begin the casting process and production on the series 2-hour pilot “Broken Bow.” Features all-new interviews with key cast and crew including series pilot director James L. Conway and series leads Scott Bakula ("Jonathan Archer"), Connor Trinneer ("Trip Tucker"), and Dominic Keating ("Malcolm Reed"). Part Three: First Flight - Charts the course for the rest of the series' first season including all-new interviews with key production and post-production personnel. 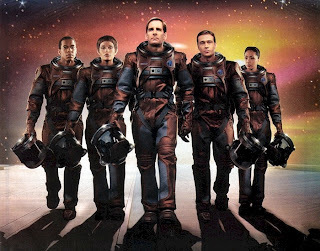 The six-disc set also includes a candid conversation with the series’ creators, Rick Berman and Brannon Braga, offering a glimpse into their creative process. In addition, the Blu-ray features brand new commentaries on select episodes from the season, along with a host of previously released special features such as deleted scenes and outtakes. 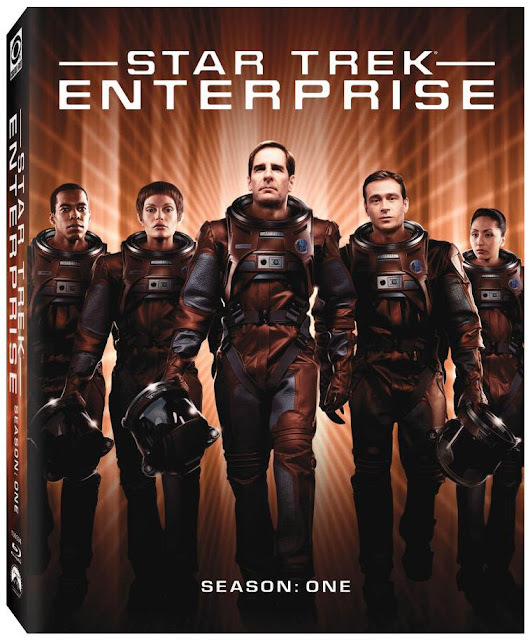 In addition to the inclusion ofthe previous DVD extra features there will be more new content in the form of In Conversation: Rick Berman and Brannon Braga, a candid discussion on the series between the two producers. There will also be On the Set, which I believe is a new blooper reel. Several new audio commentaries will be on the set too, for the episodes Broken Bow, Silent Enemy, Shadows of P'Jem, and Shuttlepod One. In other bluray news, TrekCore also report TNG season three is set for release in April. On top of that there will also be a separate stand-alone release of The Best of Both Worlds, edited together as a feature length episode, with new special features just for that stand-alone release. Cool, although not the first time this has happened, in the UK at least there was a DVD box-set of all the TNG two-parters released in feature length form, which itself was preceded by the same treatment on VHS.